Many are those who want to be the inventor of pizza, yet if we read the Holy Scripture we notice that pizza was made any time they cooked with yeast. In the “Last Supper”, Jesus Christ broke the bread that in those times was like a pie. The ancient Romans used to prepare their refectory tables by mixing some kind of flower with water making a kind of pizza cooked on burning stones. With the conquest of the ancient Egypt they imported yeast which was added to the mixture in order to obtain a product similar to the actual pizza. The modern name of “Pizza” comes from the latin verb “pinsere”, which means press, crush and squeeze. Only in 1700 we can see the “modern pizza” the actual “pizza col pomodoro”which is known around the world in different versions, but always showing the same image. The reason of this late pair off was due to the fact that the tomato was imported from America, in Europe we did not know it.We had to wait over a century and a half before the Europeans discovered the actual virtues of tomato in the kitchen and the Neapolitans transform it in its culinary flag. 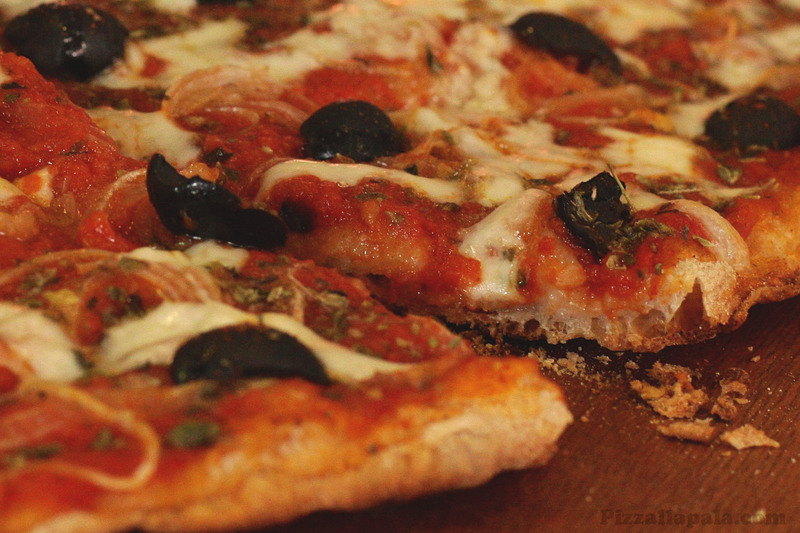 “La pizza col pomodoro” is the one which conquered popularity everywhere to be distinguished from all the others. In fact the red pizza is the most popular among the others first pizzas which were, probably the one with garlic and oil, cooked or uncooked, with mozzarella and salted anchovies or that one coved with small little fishes called “cicinielli”, wich seams to be the most ancient. On the culinary books of 1700 we found a pizza folded into a book, similar to our “calzone”with its filling. It’s only in 1830 when we get news of the first “pizzerias”, until then they used only stalls in the open air. The first pizzeria seemed to be opened in Naples called “Port Alba”because it was near the arch that from Piazza Dante was reaching Via Costantinopoli. It had the haven covered with refractory bricks with wood “forno a legna”. Later they discovered the ideal heat made by fragments of volcanic eruptions of the Vesuvio in order to obtain better pizzas. By convention “the pizza” was born in Naples on the 9th of June 1889, when Raffaele Espsito, owner of pizzeria “Pietro il Pizzaiolo” prepared for King Umberto 1st and Queen Margherita a pizza with the colours of our flag: green (basel),white (mozzarella)and red (tomato) in honour of the queen was called “Pizza Mrgherita”. The magic of four ingredients, flower, water, salt and yeast with different seasoning on top, have transformed into science, the preparation of the dough, and in art the seasoning and the cooking. The great spread of pizzerias, have modify the consumers’ demand. They now pretend a more digestive product, which does not swollen in the stomach or give a burn tasting after the meal. Negative factors which are normally attributed to the rising and to the seasoning. But all these sensations are only due to the poor fermentation of the dough.